As I write this, I am cradling my sick toddler with my left arm while I type with my right hand. Literally on one hand, I am a writer and on the other hand, I am a mom. Being able to work from home makes me both at the same time. Many moms envy women like me who can simultaneously earn a living and care for their family 24/7. I know how they feel because I used to work in an office and leaving my baby every morning was heart-wrenching. I wanted to be a work-at-home mom (WAHM). Working from home is indeed a blessing, especially for moms of little ones. However, like all jobs, working from home isn’t all roses. There’s thorns in there, too. 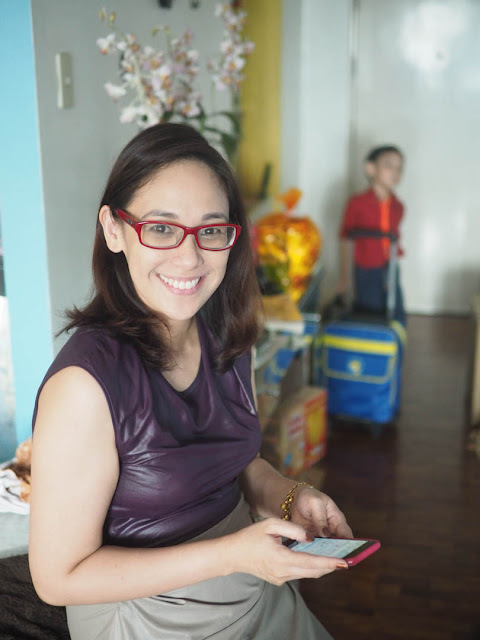 So if you’re a mom thinking of earning a living while taking care of your kids, here are five tips my friends, Martine de Luna and Jean Javier, and I came up for you. First, an introduction. Jean is the woman behind the lifestyle brand, Simple Mama. She makes scented candles, bath products, skin care lines, and many more lovely things in her own kitchen. Martine is a brand coach. On her Facebook page, she calls her work as "Transformational Personal Brand Life Coach." What is that? She offers business management services to “women-centric brands as a branding coach, a content strategist and copywriter.” She also conducts personal branding workshops under her Make it Blissful brand. I’m a writer for print and online publications, I’m currently a beauty editor for L'Oréal Paris and a contributor to beauty website Calyxta.com. I am also a professional blogger. Yes, we’re very busy women and so it isn’t true that when you work from home, you’re doing nothing. That’s an annoying misconception that you might run into once you set up shop at home. So here are a few tips to help you in case WAHM despair hits. 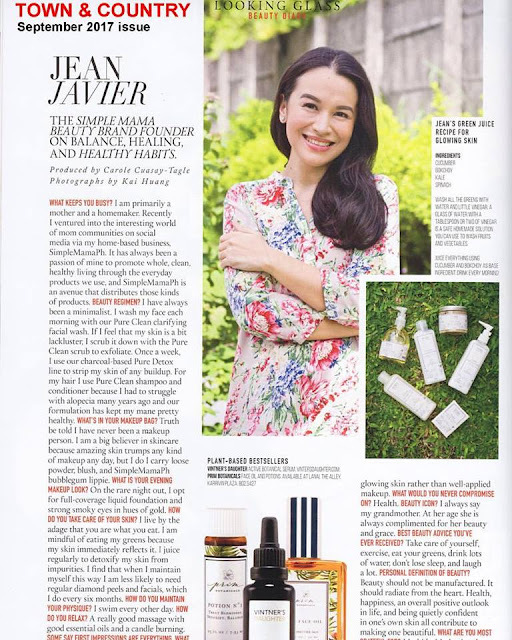 Jean featured in Town & Country. When we find the time, the three of us meet at a café to talk about work, family, and womanly concerns. The first con of being a work-at-home mom is there are hardly any other adults around to chat with. So these catch-ups over coffee are so important for us WAHMs. I have a harder time with working from home mostly because I don’t have household help. My day starts and ends with me being a mommy and homemaker. So I can only truly work when the kids are asleep, which means I hit the pillow at 3am only to wake up again at 6. This isn’t very good for my health! Martine in her favorite pink. 3. Get your family’s cooperation. For me, one of the most difficult things about working from home is that it’s my happy place. There are my books and TV shows, the chocolate and cookies, the always enjoyable chats with my husband, and the cuddle time with my kids. Plus, my bed is always tempting me with a nap! How can anyone work with so many distractions? Well, work somewhere else! Working from home doesn’t mean you literally have to be inside its walls. I like going to the convenience store of a gas station to work—unlike a coffee shop, patrons here don’t linger so there’s never anyone around! Me, always working on my phone. 5. Remember the reason why you’re working from home. Which brings me to today, a challenging day, typing this article with one hand and caring for my poor baby with the other. I’m worried about deadlines but I’m more worried about my boy. And I realize that even though I’m having a hard time juggling today, I am also incredibly lucky that I can be with my kids when they need me most. And that’s why I work from home. *This article was published for Juana.com.ph last year and is published as is except for to reflect the current work of Martine and myself, too. 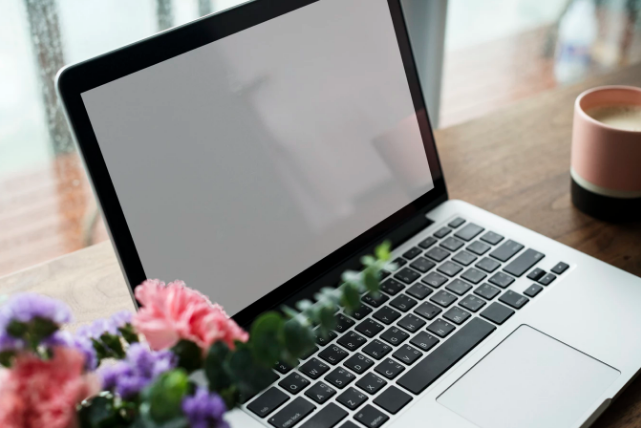 Photos from @rawpixel at Unsplash, Facebook pages of Simple Mama and Martine de Luna. Please click the links to shop at Simple Mama and to consult with Martine. Thanks!